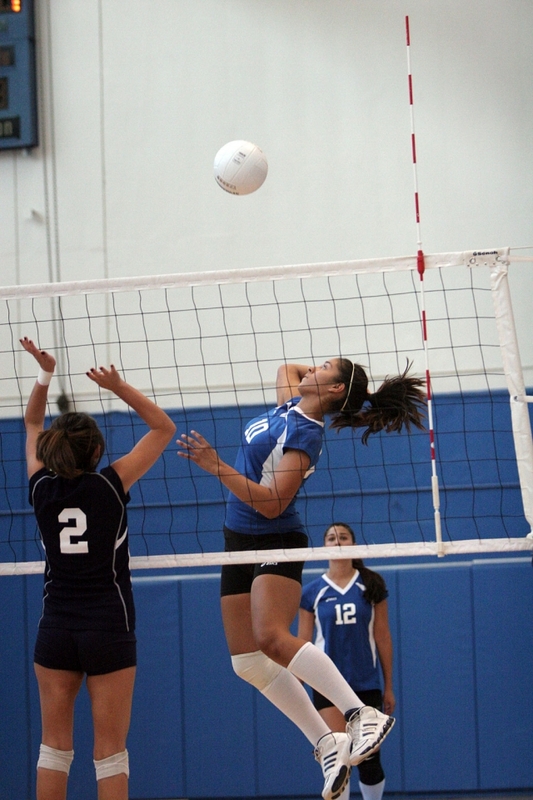 Rebecca Herrera spikes the ball against Frazier Mountain. Tory Ayala spikes the ball, getting it past the defense. 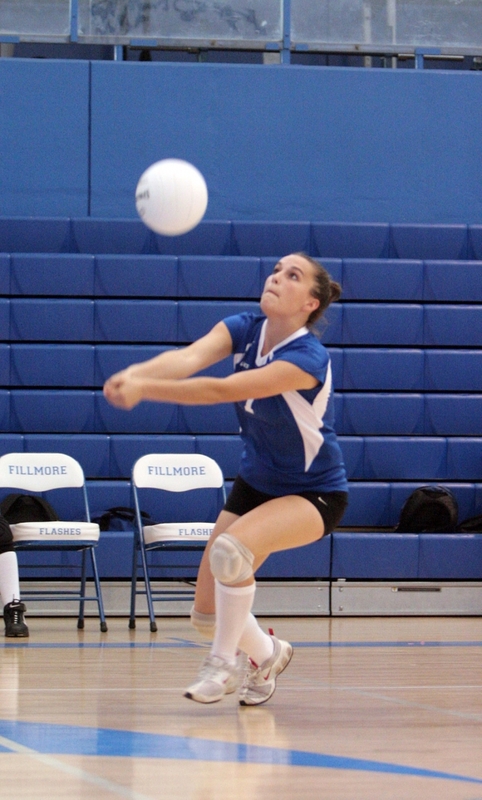 Fillmore lost to Frazier Mountain. 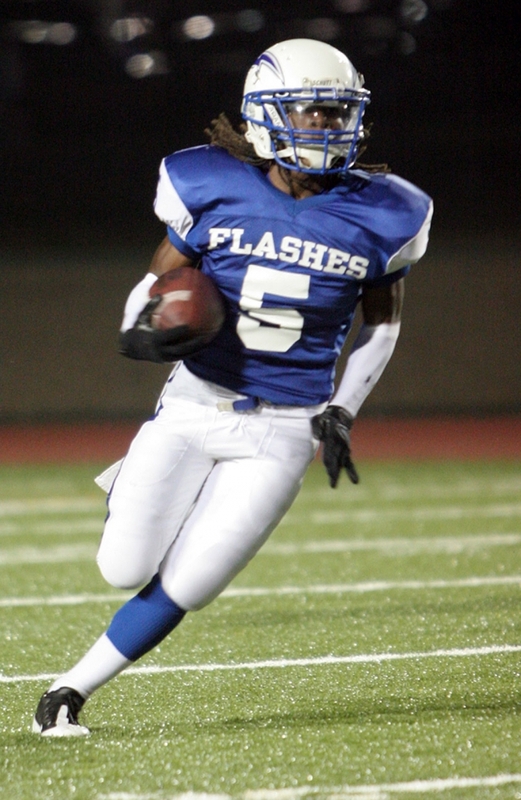 Troy Hayes had over 150 all-purpose yards and four touchdowns including a 66 yard punt return for a score, to lead the Flashes past the Channel Island Raiders. 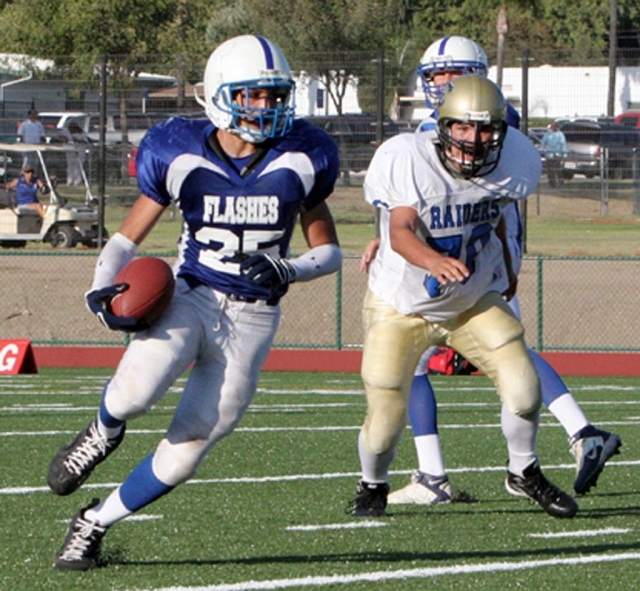 Ralph Sandoval #25, pictured above, caused a fumble in the 3rd quarter that was recovered by Marco Herrera, a key turning point in the game. Christian Prado led the defense with 11 tackles. “The team did exactly what was required of them in the second half, they didn’t allow another score and they put twenty points on the board for the go-ahead win,” stated Coach Dollar. 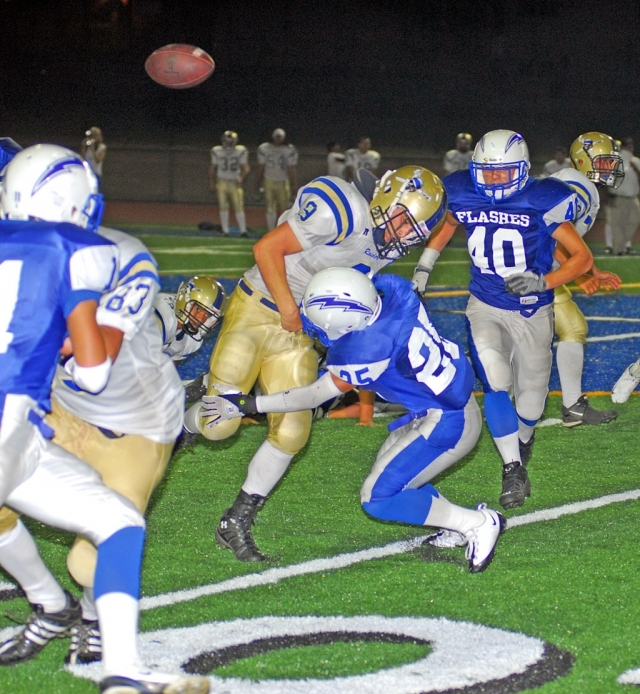 Fillmore beat Channel Islands 27-20. Austin Davis #25 pictured above, scored 3 touchdowns-picking up a fumble the first play of the game & running it in for a touchdown--he also ran one in from the backfield & caught one from Corey Cole, about a 40 yd pass. Johnny Golson threw a touchdown pass to Ben Fernandez, about a 35 yd pass. Jordan Davis had an interception. 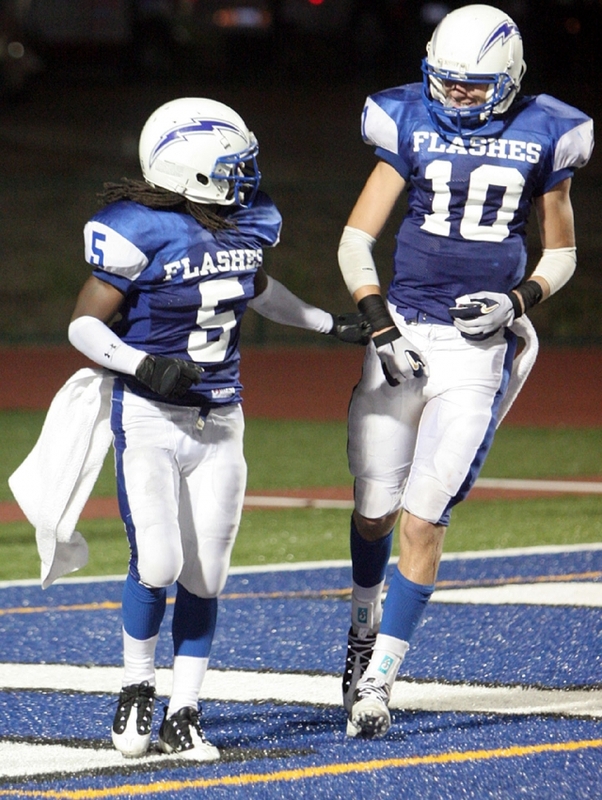 Ty Casey ran the ball well with 10 carries for about 100 yds. Joel Amaro kicked 3 field goals. On defense Anthony Edwards, Sam Orozco, Angel Beccera, & Johnny Golson played well. 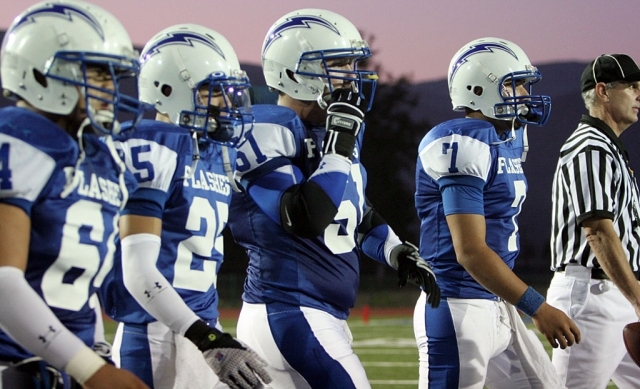 Fillmore beat Channel Islands 27-21. 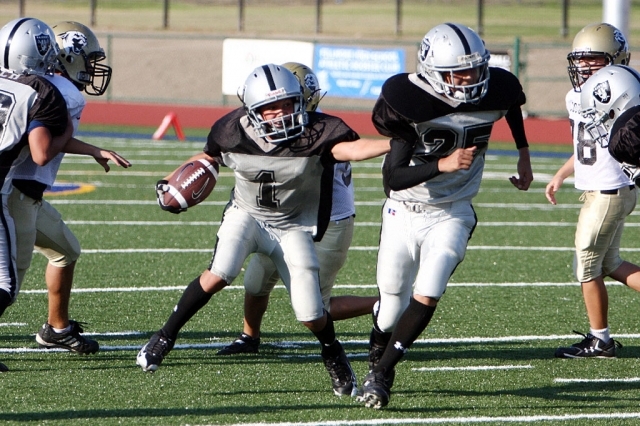 Damian Gonzalez finishes off an opposing ball carrier. Blake Palacio breaks free up the middle. 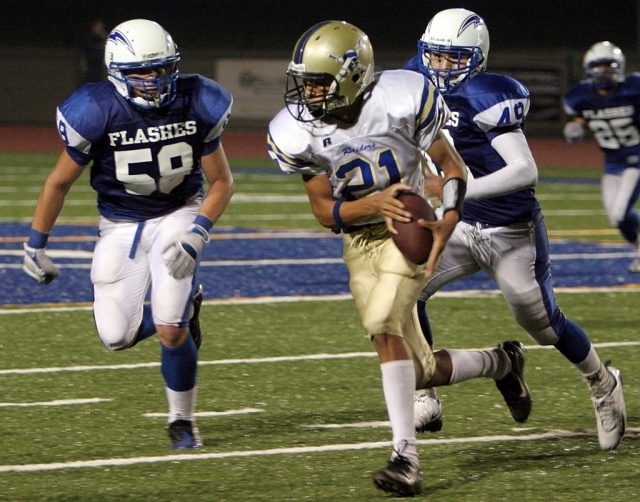 Pete Frias stiff arms a Santa Clarita defender. Fernando Gonzalez makes a punishing hit on a Oxnard ball carrier. 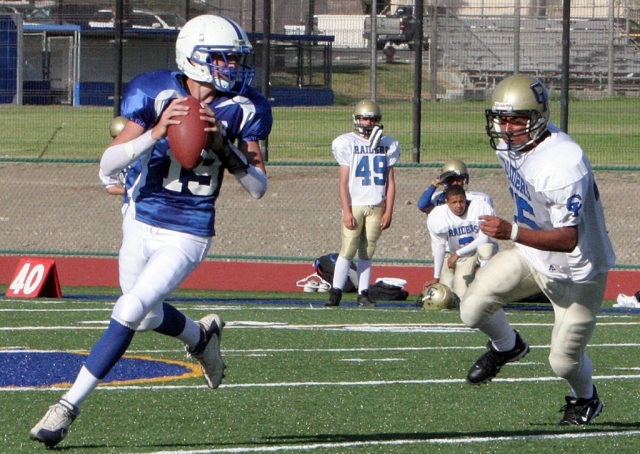 Chad Hansen follows Alex Banales through a hole in the defense. 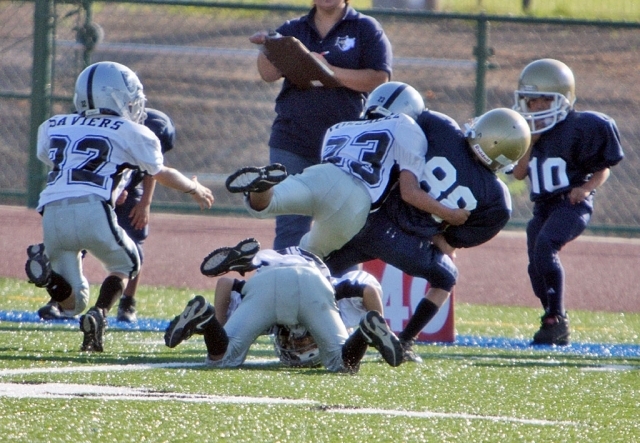 Hugo Magana breaking a tackle and heading for paydirt. Freddy Hurtado making a big defensive stop assisted by unknown player. Aaron Cronin taking down a Cardinal ball carrier. 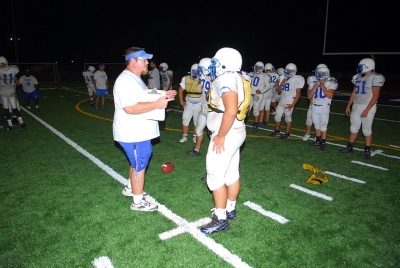 The Fillmore Flashes Varsity Football team held their first night practice last Wednesday on the new football field, underneath the new lights. The players seemed excited and proud to be on the field and one player stated that he ran faster on the new turf. Above, the players raise their helmets with a shout of “Flashes” before they end practice. 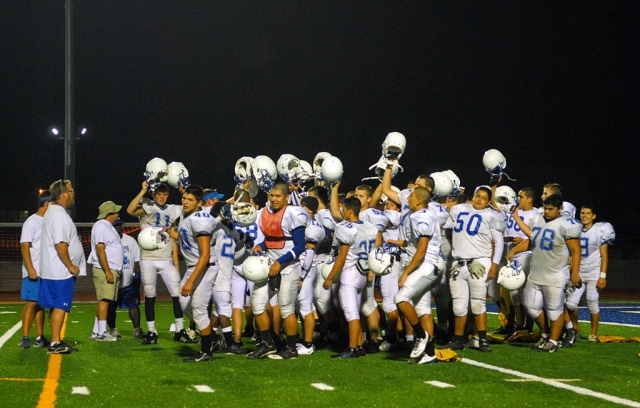 The Flashes have their first home football game this Friday (J.V. 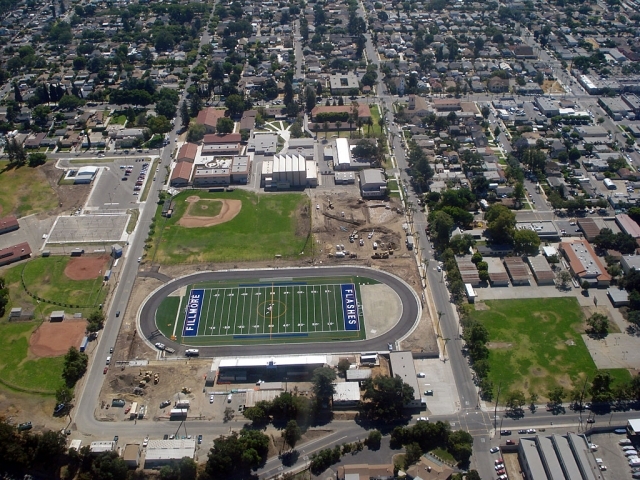 4:30 p.m. & Varsity 7:30 p.m.) against Channel Islands...... Go Flashes! 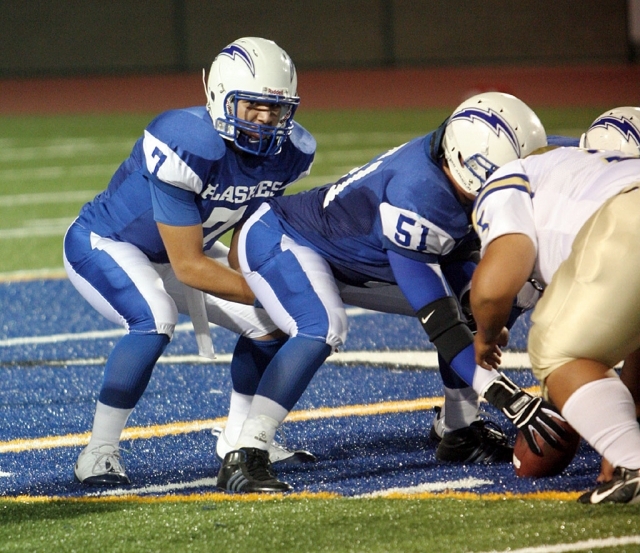 The Fillmore High School Football season opens this Friday night at home against Channel Islands High School. 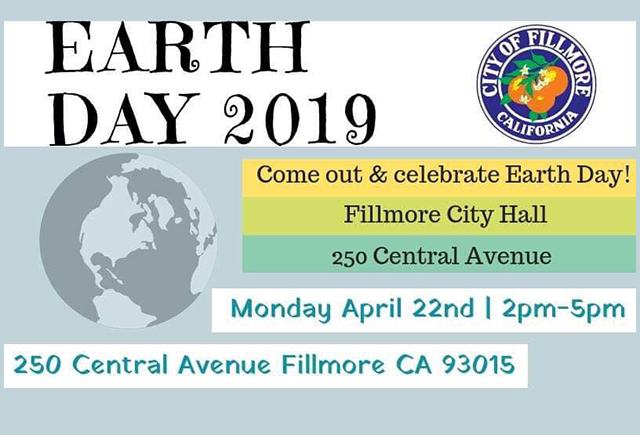 On behalf of the Fillmore High School students and staff I would like to invite you and your family to join us. 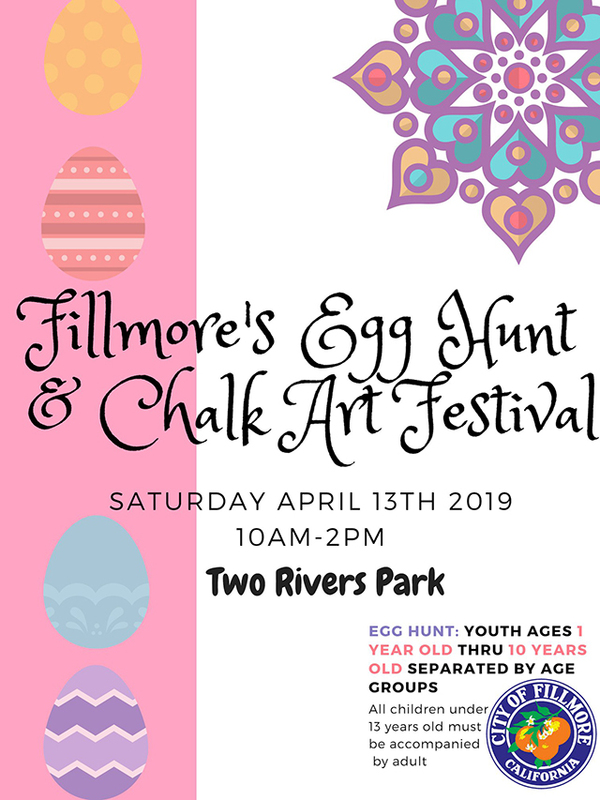 Ticket prices are $7.00 for adults, Middle School students and younger $4.00 (if accompanied by an adult), and ALL Children without an adult $4.00. Please remind your son/daughter that if they come to the game they are required to sit in the bleachers to watch the game. Students will not be allowed to loiter behind the bleachers or near the snack bar area. Students who do not comply will be asked to leave and will not be allowed to return to other games this year. We are very excited about the opening of our new football stadium, and we hope to see you there. Go FLASHES! Two Ventura County shooters have reason to celebrate after their strong showing in the Steel Challenge World Speed Shooting Championships held this past weekend in Piru, California. Taran Butler of Simi Valley won the title of world’s fastest in the Enhanced Service Pistol and Shotgun matches while also claiming a fourth place finish in the Rimfire Rifle event. In the Custom Defensive Pistol match nobody was faster than JT Tedder of Moorpark who also placed third in the Iron Sighted Revolver match. Butler shot the Enhanced Service Pistol match in a winning time of 119.63 seconds, the Shotgun match in 20.25 seconds and the Rimfire Rifle match in 30.89. Tedder outpaced the competition in Custom Defensive Pistol with a time of 137.38 and shot a time of 128.52 in the Iron Sighted Revolver competition. More than 200 top competition shooters from 19 states and 4 foreign countries competed for a share of the $350,000 in cash and prizes at the Steel Challenge which is the premier event in the sport of Speed Shooting. About the SCSA: The Steel Challenge Shooting Association (SCSA) is the governing body of the sport of Speed Shooting and organizer of the Steel Challenge World Speed Shooting Championships. To learn more about the Steel Challenge Shooting Association and the Steel Challenge visit their Web site at www.steelchallenge.com. There you will find diagrams of the stages of fire, complete listing of the 2007 results, a list of past champions, world record times and more. 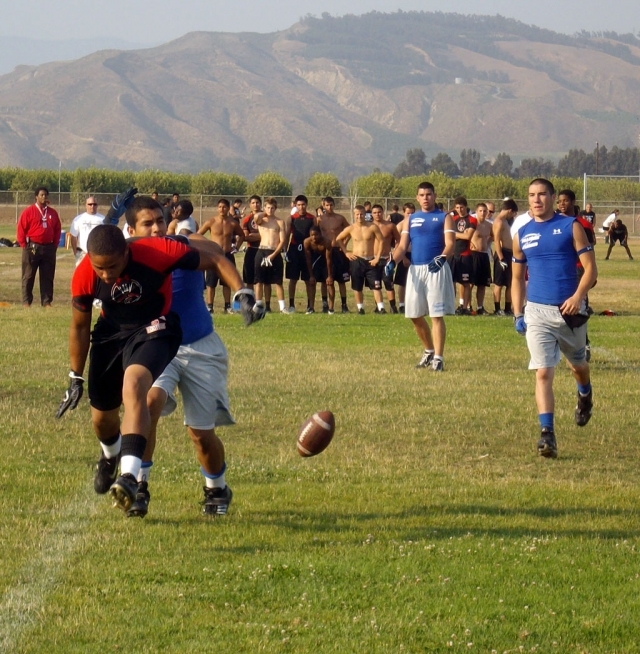 Fillmore Raiders Football started camp last week. Pictured above Joe Woods coach for J2’s is explaining a drill to the kids. This year the Raiders have 8 teams, Mighty Mights to J2’s. Pictured above: Top row (l-r) J. D. Smallwood, Luis Hernandez, Peter Egedi, Curtis Cole, Carson McLain, Brandon Pina, Damien Almazan. Bottom row (l-r) Trestan Tello, Sammy Dominguez, Joshua Sandoval, Logan Boblett, and Anthony Morales. A big “Thank You” to Curtis Cole for all of the hard work and determination he showed the boys this past couple of weeks in camp. We appreciate all the training and pointers you gave them to help with this coming football season. The boys and parents are very fortunate to have a young man who is willing to take the time out of his schedule during his summer break and teach these boys the fundamentals of football and to whip them into shape. You are a wonderful young man and we wish you nothing but the best this year at ASU. 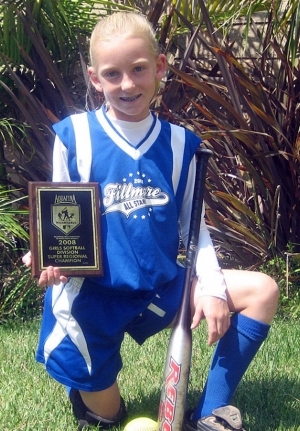 Taylor Brown, 10, of Fillmore, CA placed 2nd in her respective age group at the Aquafina Major League Baseball Pitch, Hit & Run National Finals at Yankee Stadium. The competition took place on Monday, July 14, as part of Gatorade All-Star Workout Day. 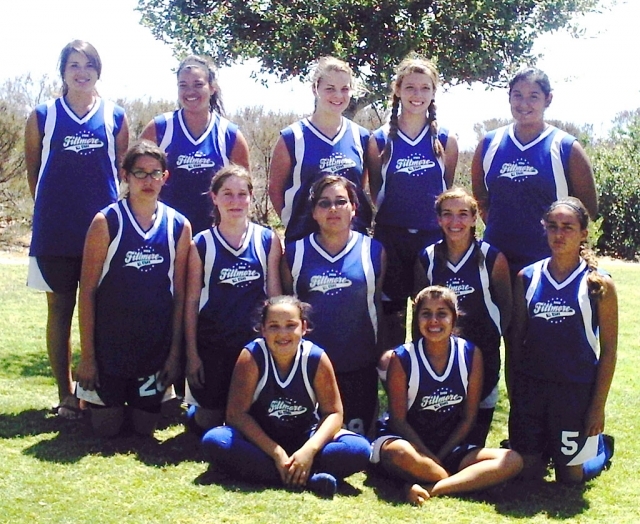 Brown, representing the Los Angeles Dodgers, was the Fillmore Girls Softball Local Competition Champion before prevailing at the Southern California Super Regional in Bellflower. A 4’3” second basemen for the Fillmore All-Stars, Taylor used her base running ability to post the fastest 9/10 year old Super Regional time of the 2008 season. All 24 National Finalist participants attended the Major League Baseball Brunch at the historic Waldorf Astoria hotel as well as attended DHL All-Star Fan Fest. Participants also took part in shagging fly balls in the outfield during the State Farm Home Run Derby on Monday night. Pitch, Hit & Run is the official skills competition of Major League Baseball. This grassroots program is in its 12th consecutive year of existence and is designed to provide youth across North America with an integrated competition that recognizes individual excellence in core baseball skills. Children compete in four age groups: 7/8, 9/10, 11/12, 13/14, and have the chance to advance through multiple levels of competition. The PHR program has produced multiple 1st round draft picks, most recently, Eric Hosmer of Plantation, FL. Hosmer was drafted third overall, by the Kansas City Royals in the 2008 First-Year Player Draft. Christopher Parmalee, of Chino Hills, Calif., was drafted by the Minnesota Twins in the first round of the 2006 MLB Player Draft, and in 2003, the Chicago Cubs drafted Ryan Harvey, of Dunedin, Fla., as the sixth overall pick. Get Ready Football Fans – The Dallas Cowboys are Back in Oxnard. 2:15 p.m. The public is invited to join in on the opening festivities as well as attending the various training sessions taking place over July and August. Parking is $10 per car and $20 for oversized vehicles. Handicap parking is available in the general parking lot and a handicap viewing area is also available at camp. The training/practice schedules will consist of two sessions on Mondays, Wednesdays and Fridays and one session on Tuesdays and Thursdays. Practice schedules are subject to change and continually updated on www.dallascowboys.com. Dallas Cowboys Experience & Entertainment . . .
All age groups can test their skills while having fun at the Dallas Cowboys Experience, which consists of inflatable games and activities such as face painting. In addition, live performances by the Dallas Cowboys Cheerleaders and team mascot, Rowdy, will be on hand to entertain the crowd. Merchandise and Hall of Fame trailers will be at the site the duration of the camp. Dallas Cowboys Cheerleaders . . .
Young, aspiring cheerleaders can learn from the professionals as the world-famous Dallas Cowboys Cheerleaders lead a free Cheerleading Camp, July 25 from 8 a.m. to 12 noon. 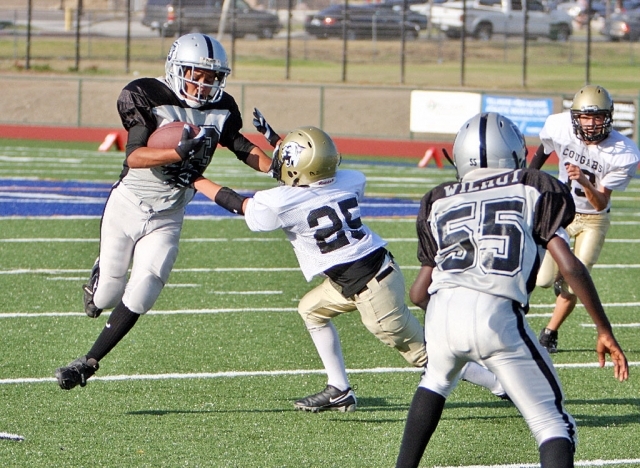 The camp is open to youths, ages 4 to 17 and will be held at Oxnard High School, 3400 W. Gonzales. An autograph session with the Dallas Cowboys Cheerleaders will follow the camp. For reservations, call 805-385-7995. Punt Pass & Kick . 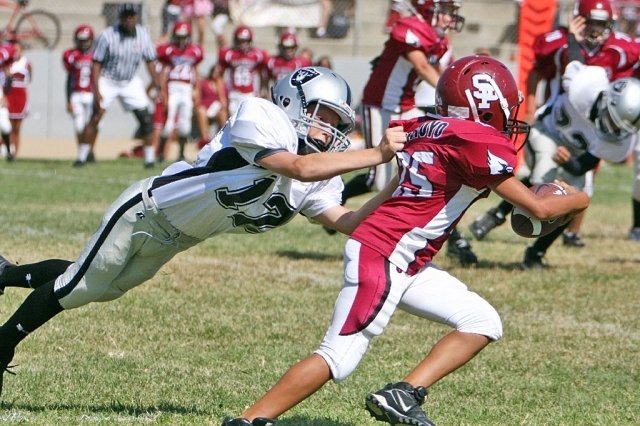 . .
Youths, ages 8-15, who dream of a professional football career or who just want to have fun strutting their stuff, can sign up for the free Punt Pass & Kick event taking place August 9 from 9 a.m. to 1 p.m. at the River Ridge Playing Field, 2101 West Vineyard Avenue. Trophies will be awarded for the top three places. Winners, accompanied by an adult guest, will have lunch with Cowboy players at their training table in addition to the opportunity of advancing to the sectional competition in October. For reservations, call 805- 385-7995. Hotel Accommodations . . .
Embassy Suites Mandalay Beach Hotel & Resort, Oxnard – The package consist of one-night's accommodations in a deluxe suite, cooked-to-order breakfast each morning, hosted beverages each evening, training camp parking pass, Mandalay Beach Sunscreen Pack, overnight self parking, wireless internet access and one training camp parking pass for each night's stay. The dates are valid July 25-Auugst 11 with a blackout date of August 8. Prices are from $257 a night. For reservations, call 805-984-2500. GrandStay Residential Suites Hotels, Oxnard – The GrandStay offers a stay in a one-bedroom suite, free training camp parking pass and a goodie bag. 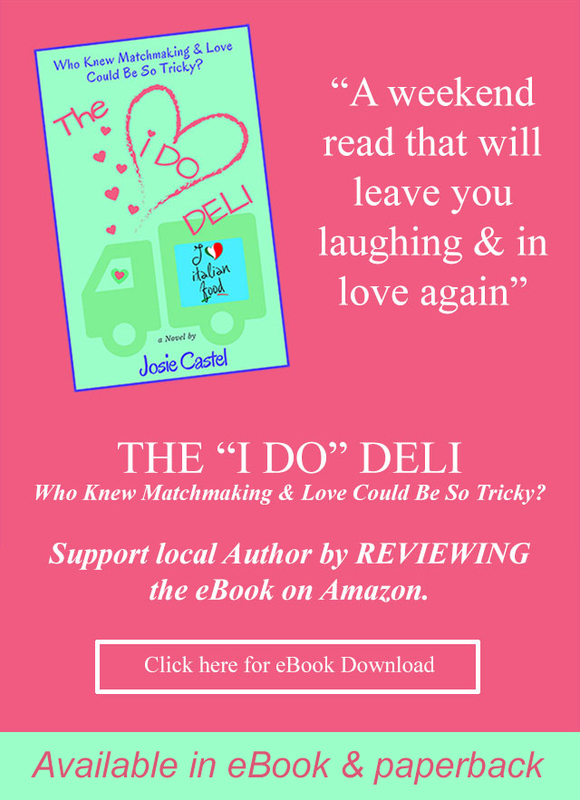 Rate is offered at $169.90 and begins July 18 and runs through the end of August. For reservations, call 805-983-6808. Hilton Garden Inn & Suites, Oxnard – The Hilton Garden Inn & Suites in Oxnard offers rates starting at $129. 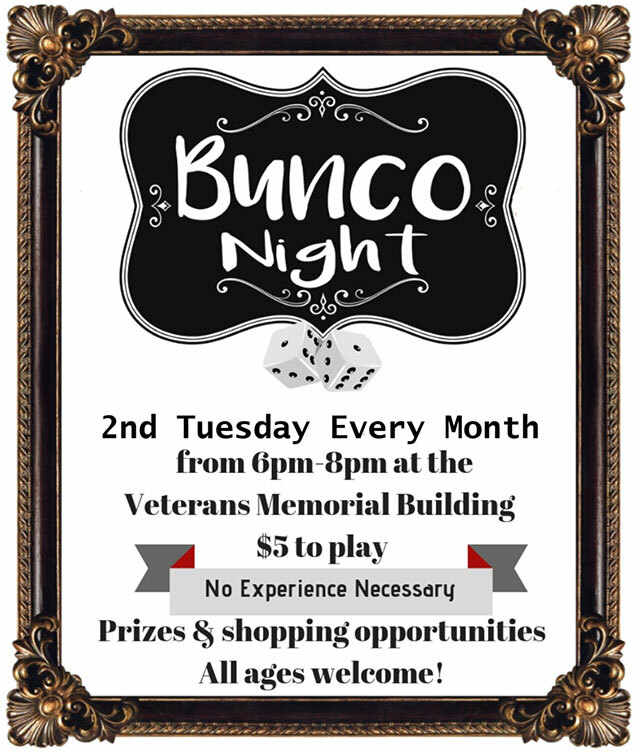 Call for reservations, 805-983-8600. Country Inn & Suites, Port Hueneme – The Country Inn & Suites at Port Hueneme offers one overnight stay for two, complimentary buffet breakfast, two complimentary beverages at evening Manager's Reception, a training camp beach towel & magnetic picture frame, and one-day training camp parking pass. The package is available at $159 for the first night reservation with additional nights offered at the hotels Best Available Rate. The rates are valid July 25 through August 13. For reservations, call 805-986-5353. Getting to Camp . . .
Oxnard is just 60 miles northwest of Los Angeles on the coast, and 30 miles south of Santa Barbara. From LAX, Oxnard is an easy 90 minute drive, 60 minutes from Burbank (BUR), and 40 minutes from Santa Barbara (SBA). United Express offers four flights daily through LAX to Oxnard (OXR). Visitors can also relax aboard the Amtrak, which offers regularly scheduled Pacific Surfliner trains to Oxnard from points south to San Diego and points north to San Luis Obispo. Upon arrival at the Oxnard Transportation Center, visitors can take a bus or cab to the Dallas Cowboys Training Camp. For train schedules and reservations, call 1-800-USA-Rail or visit www.amtrak.com. 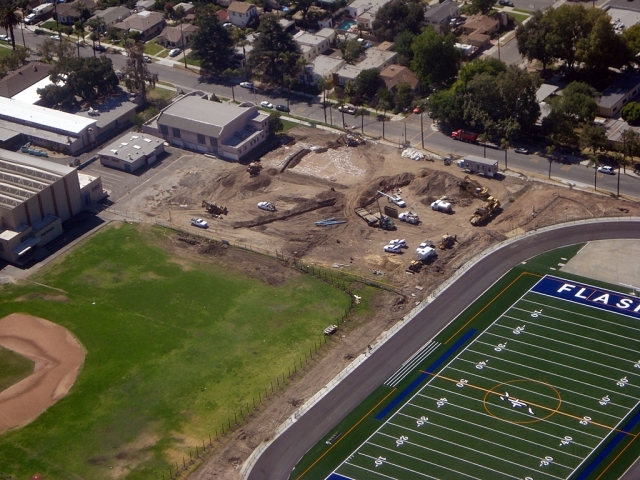 For those driving in, River Ridge Playing Fields is at the corner of Ventura Road and Vineyard Avenue. Exit the 101 Freeway at Oxnard Boulevard and travel south to Vineyard Avenue, turn right. 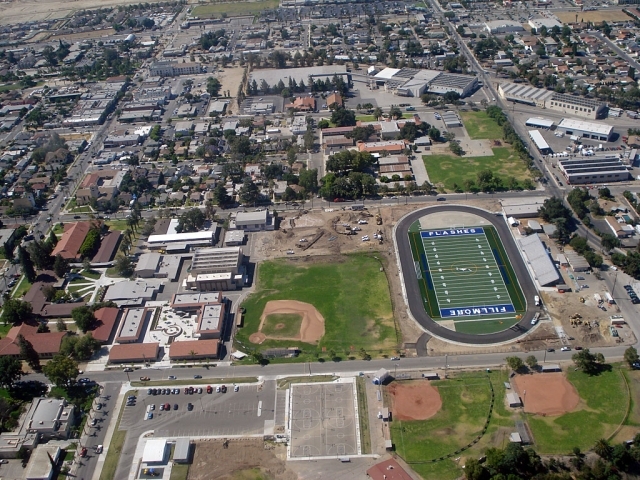 Playing fields are 1 ½ mile on the right, 2101 W. Vineyard Avenue, Oxnard, CA 93036. California Welcome Center . . .
To obtain visitor information on Oxnard and other points in between, stop by the California Welcome Center, 1000 Town Center Drive, Suite 135. At the Center, visitors can pick up a training camp souvenir! Oxnard is an easy drive up the coast from Los Angeles or from the northern portions of California. Visitors are encouraged to enjoy Oxnard's uncrowded beaches, open agricultural fields and explore the many diverse attractions and outdoor adventures that are unique to the area. A wide variety of hotel accommodations are available ranging from mid-priced rooms to oceanfront and seaside settings. For more information call the Oxnard Convention & Visitors Bureau at 1-800-269-6273 or visit the website at www.visitoxnard.com. Registration event forms and updated information on the Dallas Cowboys Training Camp is available on the Oxnard CVB's website, www.visitoxnard.com and on the Dallas Cowboys site at www.dallascowboys.com. Fillmore 14 & under All Star team pictured from Left to right top row - Rebecca Vassaur, Amanda Vassaur, Candace Stines, Roxie Neal, Mary Ortiz. Middle row - Jaynessa Lopez, Kaylee Hinklin , Rachelle ' Chellie ' Arreguin , Ana 'Speedy' Morino, Krystine Mohrhoff. Bottom row-Megan Herrera, and Vanessa Urrea . Not pictured - Reina Magana. 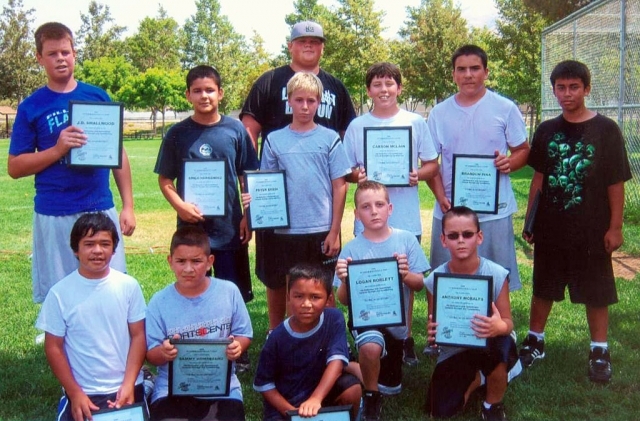 The 14& under Fillmore All star team played 4 tournaments on the road to the California State Games on July 11th, 2008 . The hard working athletes finished in 3rd place in three pre-qualifying tourneys, and in 4th place in the western district qualifier, and finally ending a successful season in 4th place in the Ca. State Regional Championships on July 13th , 2008 . The girls wish to express their thanks and appreciation first to their Manager , Ernie Ortiz, and Coaches, Bill Vassaur, and Bill Herrera, and lastly but most importantly to their families for all the cheering and support throughout the season. Santa Paula Little Cards Girls Basketball Club will be having open tryouts for the 2008-2009 summer and regular seasons. This is for girls currently in 5th thru 8th grades who are serious about becoming better basketball players, and will utilize the summer months to practice and participate in tournaments to do so. Girls’ Basketball Tryouts for the 2008-2009 summer will begin Thursday July 24th at 6::30 PM at Teague Park. All athletes should wear an old WHITE T-shirt to tryouts, shorts and good basketball shoes. Arrive early enough to warm up and stretch before scheduled tryout time. At tryouts be ready to showcase your skills and impress your coach. Your coaches will be looking for positive attitudes, athleticism, competitive spirits and an ability to function within a team. We encourage all who are interested to come and tryout. Don’t miss out on a chance to be a part of Santa Paula Little Cards Basketball Club Team. 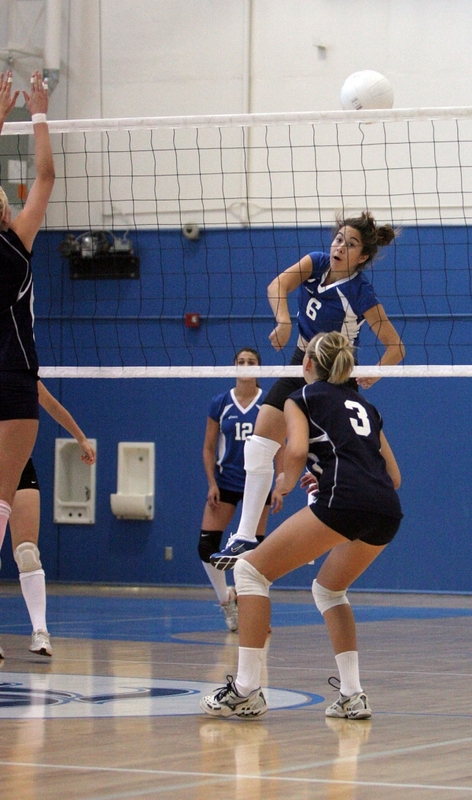 The Channel Coast Volleyball Official Association will have its first meeting for those wishing to officiate high-school games during the upcoming fall season, which begins in early September. 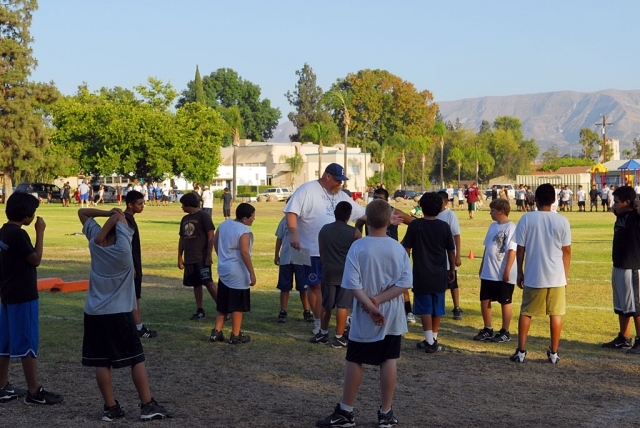 Our association referees game in Ventura County. New volleyball officials including college students are welcome. This meeting will be held on Monday, August 4 at 6:00 p.m. in the Ron Halt Community Room, Ventura Adult Education Facility, 5200 Valentine Road, Ventura. Please park in the rear. All training will be provided. 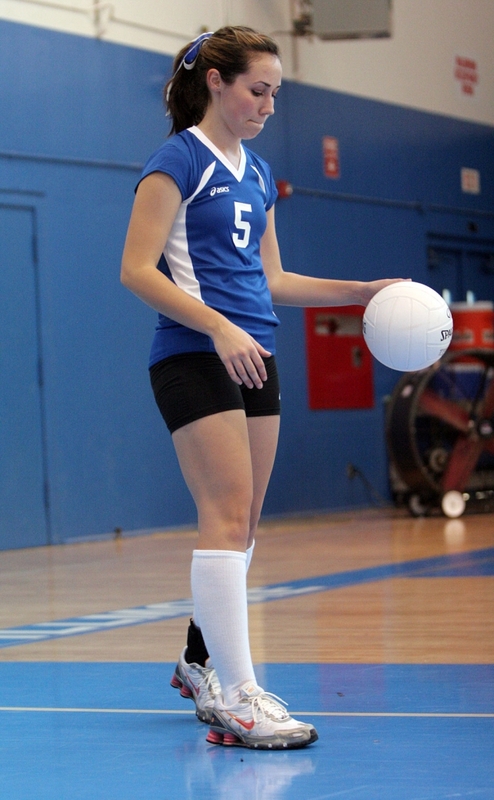 We also have a website www.channelcoastoffcials Please click on the volleyball. Taylor Brown, 10, of Fillmore. 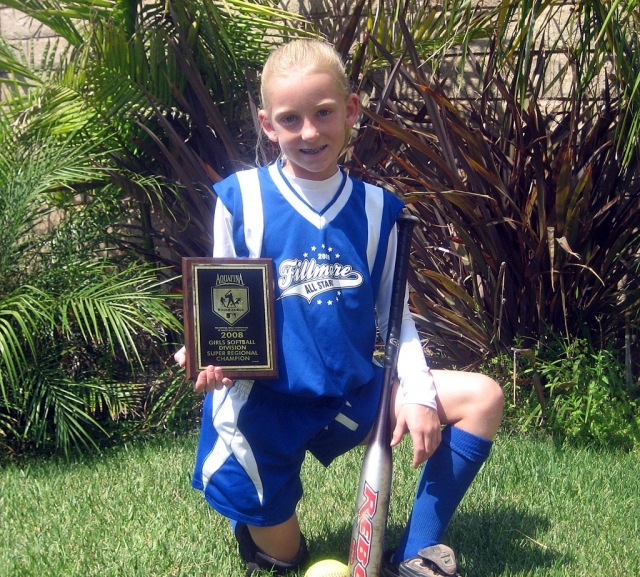 Taylor Brown, 10, of Fillmore, CA placed 1st in her respective age group at the Aquafina Major League Baseball Pitch, Hit & Run Super Regional Competition, held at Caruthers Park in Bellfl ower, CA on June 8th. Brown will now advance to the National Finals at the 2008 All-Star Game in New York, NY. The top three competitorsnationwide from each age division will compete for the National Championship during All-Star Week. 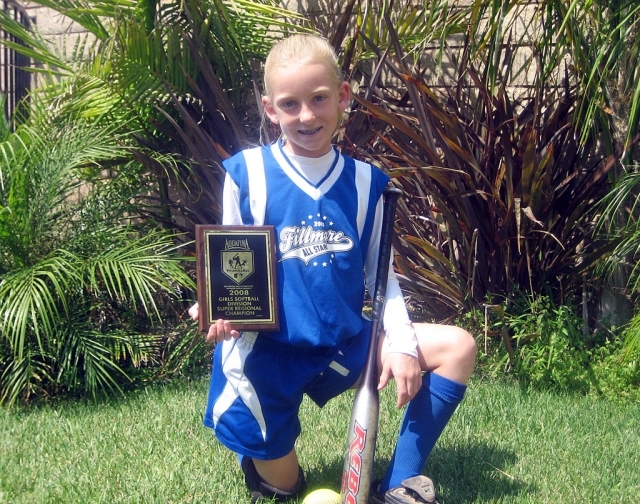 Brown was the Fillmore Girls Softball Local Competition Champion before prevailing at the Southern California Super Regional in Bellfl ower. 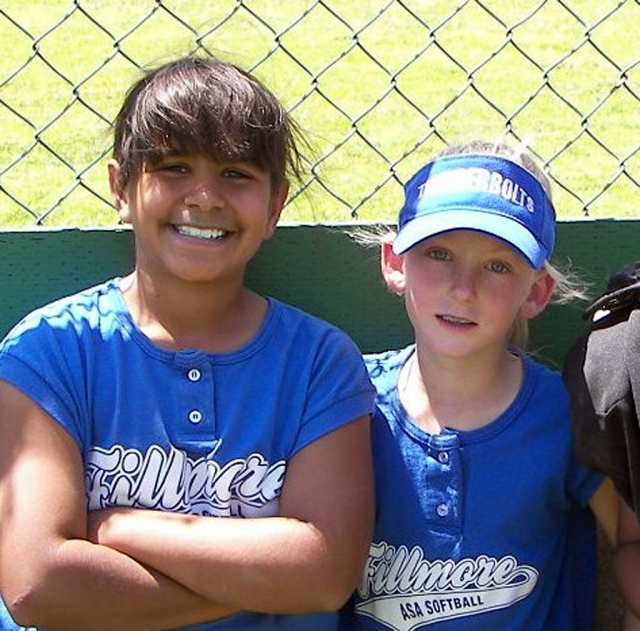 A 4’3” second basemen for the Fillmore All-Stars, Taylor started playing softball at the age of 4. Taylor lists her strongest skill as the base-running and she used that ability to post the fastest 9/10 year old Super Regional time of the 2008 season. She also made the all-star team in soccer and basketball, while carrying a 4.0 GPA at Mountain Vista Elementary. Draft, and in 2003, the Chicago Cubs drafted Ryan Harvey, of Dunedin, Fla., as the sixth overall pick. 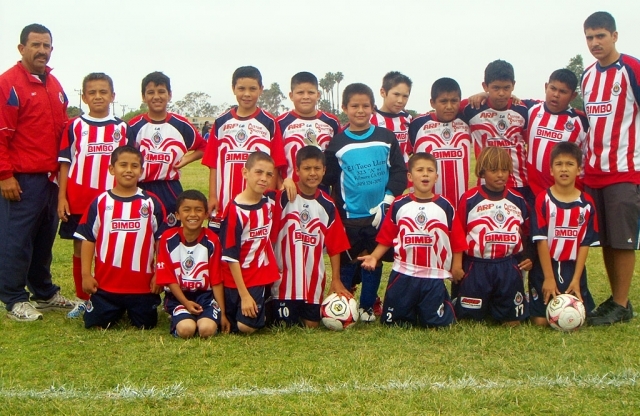 On Saturday, June 29th “CHIVAS FILLMORE” a youth soccer team took 2nd place in the spring season soccer fi nals. 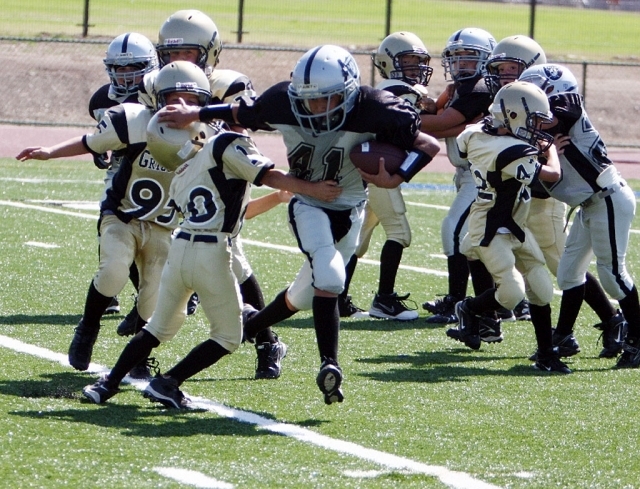 The players are between the ages of 9 & 10. Congratulations kids. Pictured (l-r) top: Trinidad Zavala (head coach), Angel Acosta, Emilio Manzano, Mathew Fletes, Abelardo Gaitan, Josue Morga, Efren Carbajal, Richard Estrella, Felix Tinoco, Fernando Gallardo, Javier Candelario (coach assistant). Bottom (l-r): Jesse Ballesteros, Yohan Medina, Luis Ruiz, Ricky Lomeli, Christian Candelario, Marcos Savala, Anthony Castaneda, Enrique Gutierrez(missing). 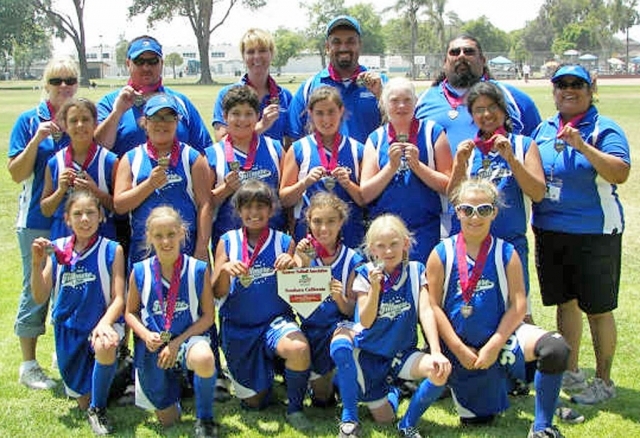 Fillmore Girls Softball 10&Under All-Star team placed 3rd in the District Tournament this weekend (Yeah!). We now qualify to advance to the Southern California All-Star State Championship to be held in Lancaster next weekend. 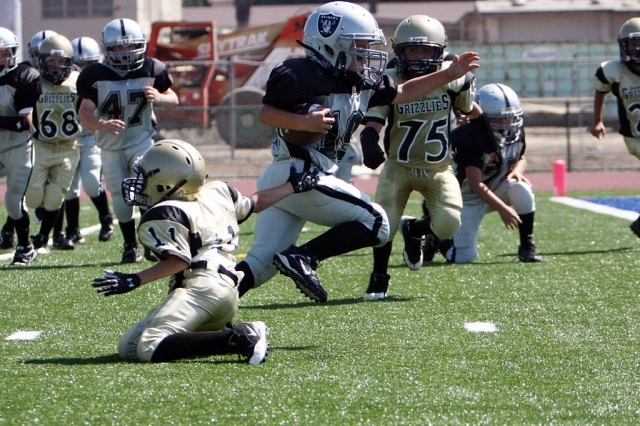 Fillmore’s first 10 & Under team to make it to State Championship play! pictured L to R starting w/ bottom row: Leah Meza, Sonya Gonzales, Sierra Huerta, Kayleigh Thompson, Taylor brown, Macie Wokal. middle row: Bailey Huerta, Lilly Duran, Elizabeth Manzano, Miranda Faulkner, Sarah Scott, Serena Venegas, top row: Coaches: Michelle Brown, Jason Faulkner, Mgr.Shelley Huerta, Mike Thompson, Leo Meza, Francine Duran. 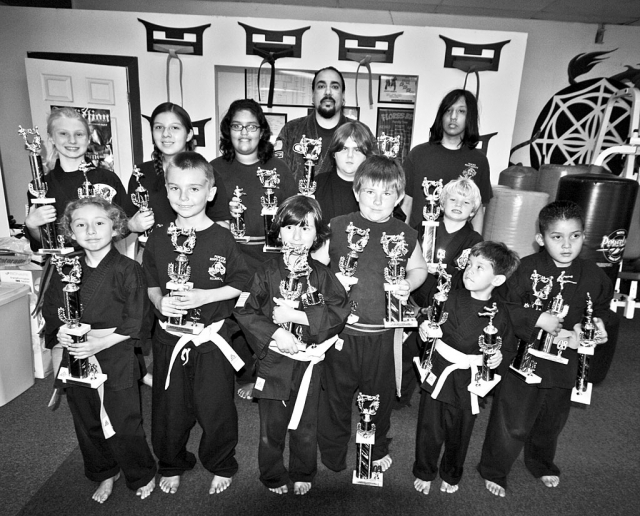 Perce's Kenpo Karate Studio recently competed in an inter-school tournament that took place at St. John's Lutheran School in Oxnard on June 21. 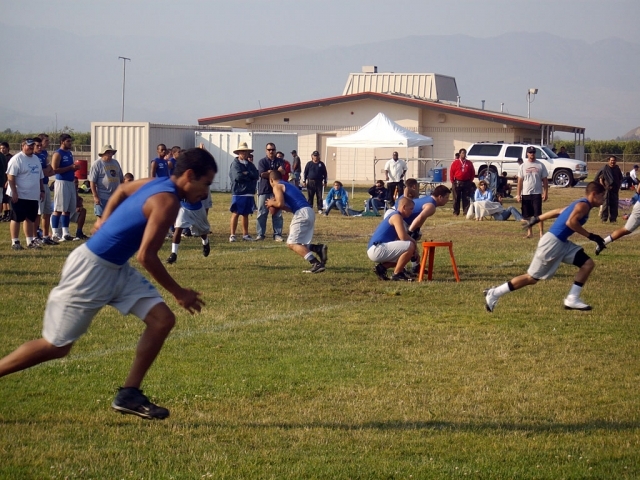 The event was a success for the students as they competed against three other Ventura County studios. The results of the event are as follows: Little Tigers 3-6 yrs. 1st place Dave Bustos Jr., Jacob Merkord, Julian Jimenez, Blake Boren. Kata White: 4-6yrs. 2nd place Dave Bustos Jr. Yellow 4-6 yrs. 4th place Blake Boren. Yellow 8-9 yrs. 4th place Jaylin King. Yellow 10-13 yrs. 1st place Brandon Hickle, 2nd place Anthony Murray. Orange/Purple 5-7 yrs. 2nd place Faith Bustos, 3rd place Julian Jimenez. Green 6-7 yrs. 4th place Tyler Bode. Green 8-10 yrs. 1st place Heather Hess, 3rd place Michael Hess, 4th place Iliana Hernandez. Blue/Green 12-13 yrs. 3rd place Valery Rodriquez, 6th place Sandra Ponce. All Belts Teen and Adult- 1st place Davin Banks, 2nd place Samuel Hernandez, 3rd place Maggie Carrillo, 4th place Sabian Howard. Jr. Brown and Black 11-13 yrs. 2nd place Andy Topete. Showmanship All Ages- 3rd place Tyler Bode. Self-Defense All Ages- 1st place Anthony Murray, 2nd place Sabian Howard, 3rd place Brandon Hickle, 4th place Tyler Bode, 5th place Heather Hess, 6th place Maggie Carrillo. Sparring Tigers- 3rd place Julian Jimenez. Purple/Blue/Green 9 - 13 yrs. 5th place Valery Rodriquez. 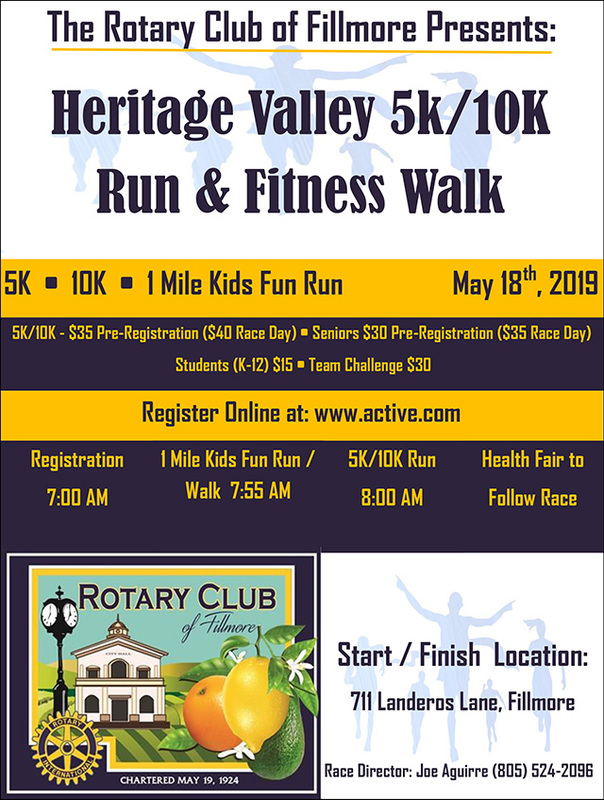 For more information please call Paul Perce at 524-6870. Congratulations to Taylor Brown for winning 1st place Nation wide in the Pitch, Hit, Run Competition held by Aquafina Major League Baseball. After qualifying at the local PHR competition, she competed in the Super Regionals where her score was compared to other scores nationwide for a trip to the All-Star Major League Baseball Game in New York. Taylor will again be competing at Yankee Stadium representing Fillmore during the home run derby as well as attending the All-Star game. The Fillmore Flashes Football team has started the summer passing league. 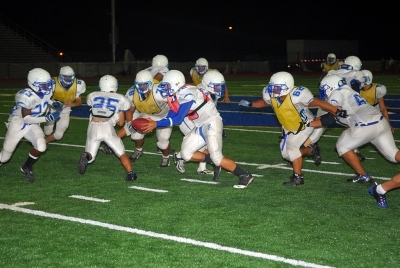 Last Thursday they played two games at Rio Mesa High School, one against Pacifica and the other against Rio Mesa. 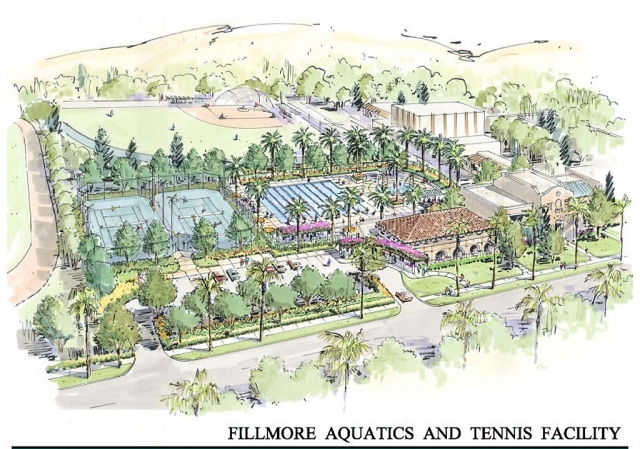 An artists rendering of the Fillmore Aquatics & Tennis Facility. 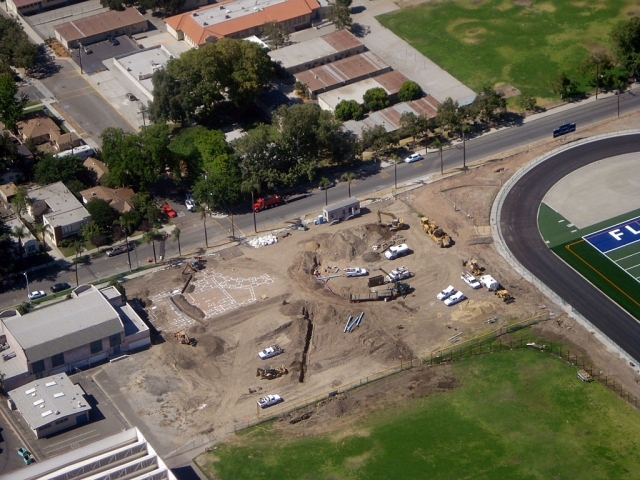 New Pool and Tennis site under construction. After qualifying at the local PHR competition, 9 year old Sierra Huerta and 9 year old Taylor Brown advanced to the Super Regional that was held on Sunday June 8th in Bellflower, CA.. They participated at the Super Regional Level in the Girls Softball Division of the Aquafina Major League Baseball Pitch, Hit & RunTM competition. Allowed the opportunity to showcase their throwing, hitting and running abilities, both girls did a great job representing Fillmore.